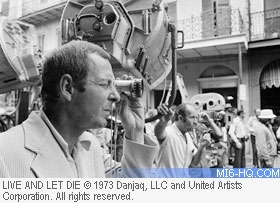 Event: "Bafta presents - Diamonds are forever: Guy Hamilton"
Join BAFTA in welcoming James Bond director Guy Hamilton, a true legend of British movie business. As a director, Hamilton masterminded a string of critical and commercial hits: An Inspector Calls (1954); Manuela (1957); Goldfinger (1964); Battle of Britain (1969); Diamonds are Forever (1971); Live and Let Die (1973), and Force 10 From Navarone (1978) just to name a few. Hamilton also enjoyed a distinguished career as Assistant Director, working with with Carol Reed on The Third Man and The Fallen Idol and with John Huston on African Queen. In this onstage interview, weâll explore this amazing life in film.